Many of you know how much I appreciate and recommend the Vanguard all-in-one ETFs. What I like most about them is that in a single ETF, it provides investors with a complete globally indexed portfolio that will automatically rebalance to maintain the set ratio of equity/bonds. All for a very low management expense ratio (MER) of 0.25%. We all know that competition is good right? Blackrock iShares has come out with their own version of all-in-one ETFs, and are just as good, and slightly cheaper! They have some subtle differences, but I’ll let you decide which you like best. Here are the three Vanguard ETFs straight from the Vanguard website. They each have a MER of 0.25%. For more details, my post about the Vanguard all-in-one products here. As you can see from the table below, even the ticker symbols are similar! These iShares ETFs are a little cheaper with an estimated MER of 0.21% (official MER not posted yet). It’s a great time to be an investor where you can build a completely hands-off indexed portfolio by purchasing a single ETF and paying only 0.21% in fees. It can get even cheaper if you go with a discount brokerage that offers commission-free ETF purchases. The biggest difference that I can see right now is that iShares does not offer a conservative portfolio (like Vanguard above), but they go head to head in the balanced and growth portfolios. Comparing the holdings of these two leading ETF providers show that there is little difference in the exposure and holdings. With XBAL, you’ll get slightly more exposure to the US market and slightly less exposure to Canada. In the grand scheme of things, that may not be a bad thing since Canadians have a tendency to have a home bias (myself included). With VBAL, you’ll get slightly better diversification with your bonds portfolio with exposure to the US and global bonds. However, XBAL gives you more exposure to corporate bonds. With only a 0.04% difference in MER, it’s a tough choice, but if I were to start a portfolio today, it would lean towards XBAL. 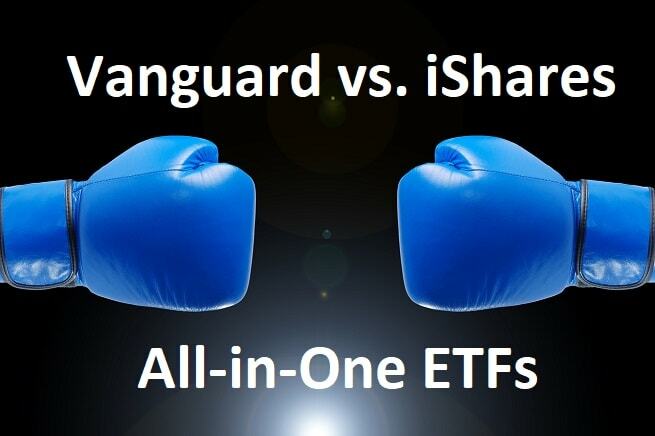 Comparing the iShares and Vanguard all-in-one growth ETFs, again, there are slight differences. iShares gives you more US equity exposure (36.5% vs 31%) and less Canadian equity (20.51% vs 23.2%). Vanguard, on the other hand, gives you better global exposure to bonds. However, this is less important as bonds are only 20% of these portfolios. Both are strong portfolios, but I like that XGRO has slightly greater global equity exposure. Comparing both products, it looks like Vanguard has met its match! While both products are very similar (and awesome), it’s a toss up on which is better. If you’ve already started a portfolio using Vanguard all-in-one products, I’d say to stay the course. If you’re new to investing, then I think the iShares all-in-one ETF line will serve you well with a slightly lower MER and slightly more equity exposure outside of Canada. Either way, investors win with the low fees and ease of use. As mentioned earlier, combine it with a discount broker that offers commission-free ETFs, and you’ll save even more! You decide, which product do you like better? Vanguard or iShares? Should a Long-Term Portfolio Have High-Risk Investments? Reader Mail: Early 20’s, How Do I Invest $20k or Less? If you set it up you can automatically take money out of your bank account on the same day of the month, every month and they will buy the shares for you. Great tip – Thanks Shea! Thanks for the tip! How do I set up PACC with iShares if I use a discount broker (in my case Scotia iTrade)? PACC means you cannot use limit orders, always market orders? That’s NOT good. Thanks for this. Curious though – – how do they compare in terms of liquidity/trading volumes? Since xgro and xbal are new, their trading volumes are lower by approx half . However these aren’t etfs that you trade , just buy and hold until retirement. Thanks for bringing up the comparison so clearly. The MERs on the ETFs listed are very attractive. I noticed that they follow a ETF-of-ETFs approach (appears similar to a fund-of-funds setup). If I were to buy 1 share of the VGRO for example, would you be able to illustrate if the MERs of each of the ETFs held by VGRO are built into the 0.25% MER in the VGRO, or is the investor really paying multiple layers of fees here? I always find the disclosures cumbersome in this regard. You would only be paying the 0.25%, it really is a great deal. Great post and thanks for putting this together. I have a question regarding rebalancing as you get older or approach retirement. Say I start with all in one growth ETFs at 20 years old and continue until 50 years. I then want to reshape my portfolio and rebalance so it’s more conservative (60% equities 40% bonds). Would it be a bit tricky to get the allocation right? Or would you simply sell all your growth all in one ETFs in exchange for conservative All in one ETFs? 1. Add a bond index ETF to your portfolio as you age (like VAB) and keep increasing VAB to meet your desired asset allocation. For example, if you add 5% of your portfolio in VAB, this means that you’ve added 5% bonds. In total, if you owned VGRO, that would result in 75% equities 25% bonds in your portfolio. 2. Sell pieces of VGRO as you age while adding VBAL. This will add your bond exposure over time, and eventually, you’ll switch entirely over to VBAL. This method would require a little more math to determine your asset allocation. Do you have a preference for one over the other when it comes to investing for an RESP. Our kids are 4 and 1 now, so we have some time, but clearly not as much as saving for retirement. I was thinking of choosing XBAL for their education savings. Thoughts? It’s a risk tolerance question, but for longer timelines (very young children) it may be of benefit to be more aggressive (vgro or xgro) then increase bond exposure as the kids get closer to post-secondary. However, to answer your question, xbal or vbal would be fine. My issue is the dividend withholding taxes from these ETFs. I recently read an article by two accountants which clearly show withholding taxes are taking a bigger bite out of ETFs returns than fees. I am seriously thinking of using VGRO in my TFSA, RRSP, CCPC and taxable accounts. The main difference is I would not DRIP in the taxable and CCPC accounts. I plan on holding 25% laddered GIC and 75% VGRO in my CCPC. This would make this a 60/40 portfolio. Perhaps there will be some tax inefficiency. But I can manage a portfolio like this very easily. That alone would be worth it to me. I’d say go for it Dr. MB! There is value in simplicity. How do these work in terms of pricing? Over the last year, VGRO has not gone up or down more than a couple of dollars. In terms of investing for retirement, are we to expect that the value of these ETFs might fluctuate more and gain more in dollar value over time? These funds will mimic the broad market (index). So if a comparable index portfolio goes up by 10% , vgro should do about the same . 2018 was a rough year for the broad index which means investors in general. Remember to think in terms of decades rather than years . Markets go up over any 20 plus year period. If you look to the performance of all of them, you are better off with a GIS over 3%. There are much better options in the market. That’s not true at all. These are young funds, about a year old, and the past year has not been great for the market as a whole, so for sure the performance the last year hasn’t been great. But over the long term, there’s no comparison. The 10 yr annualized return for VGRO would have been about 9% and for VBAL would have been about 7.8%. Over 20 yrs, they would have been identical at 5.2% annualized. I’m a bit confused with the MER of XGRO, the Fact Sheet states it is 0.80% which seems a lot higher than VGRO at 0.25%? I have the same question, the fact sheet does not show a better MER than VGRO. Do you feel these sort of funds are better suited for smaller balances? I’ve heard John Hood on BNN say a few times, these are great for small accounts. What drawbacks of putting large amounts in VGRO? What are the alternatives? These are good for smaller and larger balances IMO. What did John Hood say about investing for larger balances? What is considered a large balance? I’ve only heard him reference a dollar amount once for small accounts and that was $35K, I believe. If someone is considering placing most or all of their RRSP into VGRO, this would be well above $35K and into the 6 digits. Perhaps at a higher amount, it may be better to build your own portfolio without all the diversification of the ETFs??? Not sure what the logic is there. My advice would be to continue using index ETFs no matter the size of your portfolio. Of course, when portfolios/net worth gets really large, some decide to move into private equity/real estate etc, but a large part of market exposure should be indexed (imo). RKB, I would look at your entire portfolio to help decide which investment strategy to go with. When do you plan on retiring? Do you have a pension with your employer? What is your risk tolerance? Can you sleep at night with a volatile market? At 50, and a traditional retirement at 65, you may want to look at more balanced products like VBAL, XBAL, or ZBAL that have 60% equity and 40% fixed income. If you already have a defined benefit pension (which acts like fixed income), then you may want to get more aggressive and go with VGRO/XGRO/ZGRO. At least that is my opinion. I’m 37. I’m balanced type. I have 25k celi, 40k reer and 15k reee (kid 8). Should I put everything in VBAL? Or mixed with VGRO or something else?! Hi Kat, very challenging to give you a definitive answer as everyone has different risk tolerance. But if I’m interpreting the “balanced” type correctly, then VBAL might be a better fit.